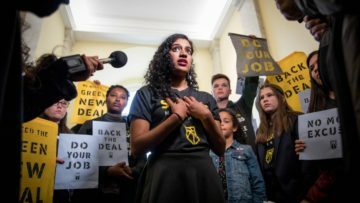 UPDATE: On February 7, Rep. Alexandria Ocasio-Cortez and Sen. Edward Markey introduced a Green New Deal resolution (formally known as H.Res 109) to lay out the goals, aspirations, and specifics of the proposed policies that Congress may now consider. The resolution itself can be read here. For more than a decade writers, advocates, and even politicians have been discussing the need for broad-reaching, ambitious policy that addresses climate change in a way that transforms our entire economy. Today the concept of a “Green New Deal” is gaining momentum as a kind of modern reboot of President Roosevelt’s New Deal projects and programs during the 1930s, but this time with a 21st century focus on decarbonization, jobs, and justice. Spurred in part by dire projections in the recent National Climate Assessment and Intergovernmental Panel on Climate Change reports, members of Congress and most notably New York Rep. Alexandria Ocasio-Cortez have begun speaking in earnest about the importance of big, bold policy action to address climate change by decarbonizing our economy while at the same time making it more fair and more just. If a government program that boosts clean energy development while strengthening the economy sounds familiar, perhaps it is. Some would argue that the stimulus bill, officially known as the American Recovery and Reinvestment Act, implemented at the height of the recession is a kind of prototype for Green New Deal on a smaller scale. I wrote a brief blog about the clean energy aspects of the stimulus package back in 2009 here. Fast forward a decade and we have dire warnings from climate scientists about the urgency of slashing carbon pollution as well as growing evidence that communities hardest hit by economic and societal discrimination – including low-income communities, communities of color, indigenous communities – will suffer the most from the impacts of climate change. Thus the importance of a vision that addresses these critical and interwoven elements: climate, economy, and justice. Furthermore, anchoring a policy proposal with a focus on jobs and justice gives it a broader public appeal than with a singular focus on climate policy alone. Despite polling that suggests there would be strong bipartisan support for a concept like the Green New Deal, there hasn’t been much coverage in mainstream media yet, though plenty of good in-depth pieces starting with this detailed backgrounded piece from Vox.com and this piece from The Intercept. But at a regional level, what could a Green New Deal mean for the Southeast and the work SACE does to change the way we produce and consume energy in this region? Below we will explore some of our region’s unique characteristics, and what implications they may have on how a Green New Deal would influence our Southeastern communities. With thousands of miles of coastline threatened by an already-rising sea, hundreds of coastal communities dependent on tourism, and agrarian economies vulnerable to a changing climate, the Southeast may feel the impacts of climate change more acutely and more quickly than some other parts of the United States. Policies and programs to lower the pollution causing climate change may help decrease the impacts our coastal and rural communities feel. This chart from an ACEEE report shows Memphis has the highest energy burden in the US. The Southeast is also home to four of the top 10 highest “energy burden” cities in the country – areas where low-income households pay proportionately more than the average household in energy costs. And nowhere is the burden as great as it is in one Southeastern city: Memphis, Tennessee: ranked as the highest burdened city in the US in a report by the American Council for an Energy-Efficient Economy (ACEE). Our region as whole, and these impacted cities in particular, would benefit greatly from government policies designed to invest in energy efficiency programs, create new jobs to support these programs, and lessen these disproportionate impacts. While Southeastern states, on average, mirror the national unemployment rate of 3.7%, people throughout the region (particularly those in Alabama and Tennessee where there was a slight rise in the rate of unemployment from 2017 to 2018) would benefit from growth in 21st century jobs in the clean energy, clean transportation, and new economy sectors – particularly as economists are warning of an economic slowdown or even another recession by 2020 after a decade of growth. It’s worth noting that solar jobs, in particular, pay above the national average, which means Southeastern residents could get better jobs with clean energy. Just ten years ago, the Southeast’s energy portfolio had scarcely any utility-owned solar energy developments and was largely dominated by coal with significant amounts of natural gas and nuclear. 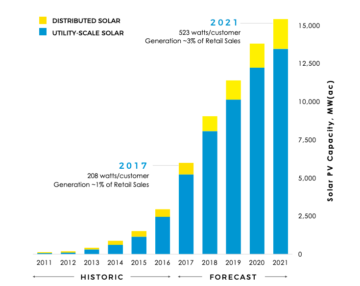 However, sound policies like North Carolina’s Renewable Energy and Energy Efficiency Portfolio Standard (REPS), in combination with rapidly-declining solar prices, means that we have witnessed exponential solar growth in the last decade. According to a report issued by the Southern Alliance for Clean Energy last year, we could see more than 10,000 megawatts of clean, solar energy powering the Southeast by the end of this year. Even with the projected 15,000 megawatts of clean solar power by 2021, solar will only comprise 3% of electric generation in our region, so there is more potential to fulfill, with jobs and environmental benefits along the way. A Green New Deal would further incentivize renewable energy deployment in our region both to decarbonize our energy sector and to create good jobs. Challenges to something this bold and ambitious are many. Scientists at the IPCC note the steps required to decarbonize our economy in time to avert climate change’s worst impacts would mean a rapid transition to 100% renewable energy by 2045 (skeptics question whether that’s even possible). Furthermore, there’s no agreed upon roadmap or even policy frame for enacting such a bold vision even among the ideas supporters. Yet possibilities abound and energy is building. Some of the most vocal proponents of a Green New Deal are young people who are acutely aware that they will have to live with the effects of climate change, and so are demanding a plan that starts off with what is necessary rather than what is currently politically possible. To that end, on November 13, 2018, youth activists staged a congressional sit-in in demanding that Speaker Nancy Pelosi establish a select committee on the Green New Deal instead of (or at least in addition to) a select climate crisis committee that Florida congresswoman Rep Kathy Castor is tapped to chair. Worried that a committee without subpoena power or bill-drafting authority will not have the ability to address climate change issues in the 12-year timeline noted in the recent IPCC report, young activists and some congressional freshmen are demanding bolder steps including direct action as part of a broader movement. Varshini Prakash is shown at a Sunrise Movement sit-in in Nancy Pelosi’s office on Dec. 10, 2017. Copyright Sunrise Movement. It’s too soon to know whether congressional committees will take meaningful climate and clean energy action in this Congress or whether climate change will emerge as a top-tier issue in the Democratic primaries or the 2020 general election. But with climate action intertwined with justice and jobs, the Green New Deal may finally see ‘climate policy’ freed from conference rooms and committees, where many a climate bill has died in the past, into the streets to engage the public and truly build a movement. SACE will continue to support a wide range of policies and programs at the state and federal level that promote clean energy as a solution to climate change, and invite you to join our efforts.